The rear parking assist system assists the driver during backward movement of the vehicle by chiming if any object is sensed within a distance of 47 in. (120 cm) behind the vehicle. This system is a supplemental system and it is not intended to nor does it replace the need for extreme care and attention of the driver. 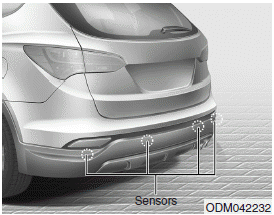 The sensing range and objects detectable by the back sensors are limited. Whenever backingup, pay as much attention to what is behind you as you would in a vehicle without a rear parking assist system.